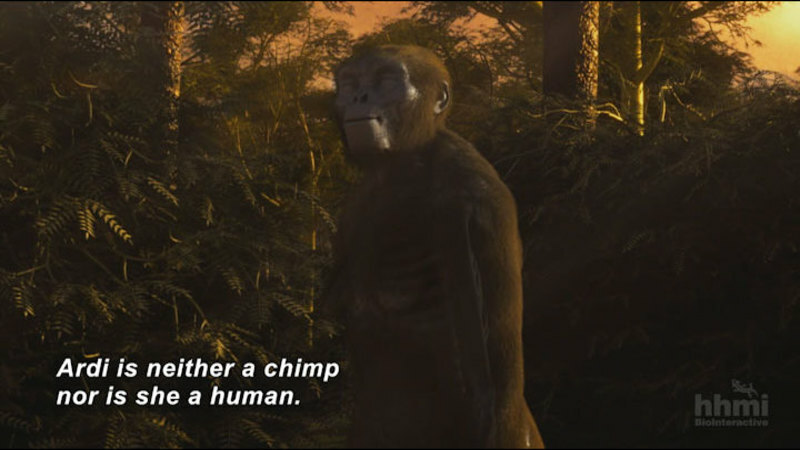 (female narrator) The animal kingdom is made up of major groups recognized by key traits. Fish have fins. Some land animals have four legs. Others, six. Several different groups have wings. Biologists have long sought to discover how groups of animals and their key features evolved. One of the greatest mysteries has been the origin of birds. Our world has more than 10,000 species of birds with feathered wings. Where did birds come from, and how did wings and feathers first arise? 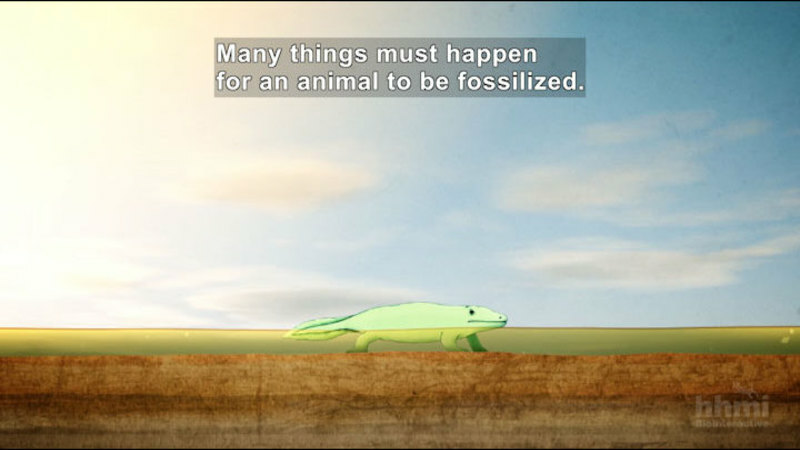 To find out, scientists have scoured the fossil record. They have uncovered surprising twists in the evolution of birds from their flightless ancestors. In the past 30 years, we've found a trove of new fossil discoveries. The origin of birds is one of the best documented transitions in the history of life. I'm fascinated by birds. As a paleontologist, I've spent my career chasing their evolutionary origins in the fossil record. Above all else, what makes birds unique are their wings. They're made of feathers that are stiff, yet flexible. Bird wings are even more remarkable than airplane wings because they can flap, which allows them to maneuver rapidly and ultimately defy gravity. The quest to understand the origin of birds and other animals began in earnest over 150 years ago. When Charles Darwin wrote the Origin of Species, he argued that every major group of animals evolved from a preexisting one. He predicted that we would find fossils with features that linked one major group to another. In fact, he staked his theory of evolution in the existence of these intermediates. But no fossils were yet known that revealed these transitions. Then just two years later, a marvelous creature was unearthed from a limestone quarry in Germany. The 150 million-year-old fossil named Archaeopteryx rocked the scientific world. This Archaeopteryx fossil is truly remarkable. It preserves, in fine detail, feathers along the wing, just like those we see in living birds, and feathers along the tail. The bony features tell a very different story. If we look closely, we'll see teeth in the jaw, tiny claws preserved in the hand, and a long, bony tail, lacking in living birds, but present in things we think of as traditionally reptilian. For Darwin, it must of been an incredible vindication. He predicted that we would find forms like these. 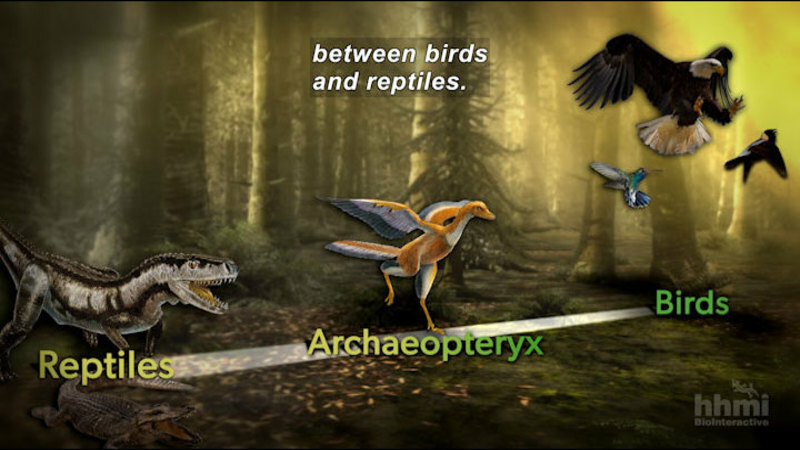 Archaeopteryx pointed to a close link between birds and reptiles. But which group of reptiles? Flying pterosaurs had been discovered with light, hollow bones. But their wings are constructed very differently than the wings of Archaeopteryx and birds. Here is a tiny pterosaur. If we take a closer look at its arm, we'll make out three small digits, and a fourth which is really, really long. The membrane of a pterosaur wing attaches to this fourth digit and along its body and hind limb. In contrast, the wings of Archaeopteryx and birds have only three digits, and their feathers attach individually along their arm and hand bones. These differences tell us that pterosaurs and Archaeopteryx evolved flight independently. Archaeopteryx must have descended from different reptiles. Thomas Huxley, Darwin's champion, was astonished by Archaeopteryx's resemblance to a turkey-size dinosaur called Compsognathus. Compsognathus's hand also had three digits. It had hollow bones and stood on two legs. Similarities like these led Huxley to propose that birds are related to the branch of reptiles called dinosaurs. But other scientists questioned this conclusion. Birds appeared so different from dinosaurs. And some characteristic features of birds, like wishbones, seemed to be missing in dinosaurs, but were present in other reptiles. (male) We found an articulated foot. (narrator) When paleontologist Jack Horner began his career, few thought that birds could have come from dinosaurs. Jack, why was it so hard to believe that birds and dinosaurs were related? Most dinosaurs the public knew about were really big. This is a shoulder blade of a sauropod. Sauropods were gigantic. and slow-moving like other reptiles. (male) People couldn't imagine dinosaurs being agile and hoppin' around. They look at these giant things and they lumber. There's no way to relate them to birds. (narrator) Then in 1963, John Ostrom discovered a fossil in the badlands of Montana that challenged that view. What John Ostrom first found was this claw. Obviously goes to a foot. It was not a claw for walking on. This dinosaur actually used that claw for slashing. (narrator) Deinonychus was small with a delicate build. It ran upright on two legs. It had a long, stiff tail for balance. Not all dinosaurs were big and lumbering. but warm-blooded and fast-moving like birds? When Ostrom compared Deinonychus to Archaeopteryx, he saw that they both had lightly-built hollow bones. They shared even more features, including long arms and similar hip and shoulder bones. Ostrom concluded that birds did descend from dinosaurs, as Huxley had argued. Not from lumbering sauropods, but from another lineage called theropods that walked on two legs and included T. rex and agile predators like deinonychus. While some scientists did not accept this idea at first, supporting evidence continued to accumulate, including the discovery that theropods had a feature of birds not previously found-- a wishbone. People had looked for them and didn't know what to expect. Then, all of a sudden, we started finding them. Here is the wishbone of Tyrannosaurus rex. (narrator) When scientists analyzed the skeletons of theropods and birds, they found too many similarities for any explanation but common ancestry. Jack's collection at the Museum of the Rockies offers an opportunity to compare their features. Here's an Albertosaur tibia. As you can see, it's hollow. Just like a modern bird. This is a T. rex foot. What we see here are three forward-facing digits that bear the animal's weight. In the back, a much smaller digit. This chicken foot has the same pattern. We've got three forward-facing digits and on the back, a much smaller one. All dinosaurs share an S-shaped neck. You can see it here and in living birds like this chicken. New kinds of evidence also emerged. In 1978, Jack made the surprising discovery of a vast dinosaur nesting ground. (male) We discovered that dinosaurs nested in colonies, cared for their young, brought food to their babies. We also had evidence that they came back, probably repeatedly, for many years, to the same site. (narrator) In a radical shift, by the 1980s, a consensus was finally building that birds descended from theropod dinosaurs, from active predators that walked on two legs. But scientists were about to discover the most startling evidence of all. In the mid 1990s, farmers in Northeast China began unearthing dinosaurs 120 million years old. These fossils preserved astonishing detail. In 1996 I was a first-year graduate student at my first scientific meeting. They were passing around pictures of this dinosaur. This chicken-size theropod named Sinosauropteryx did not have scales. It was covered in some primitive kind of feather. To see those photos of a tiny, fuzzy, dinosaur, it just blew everybody's minds. This dinosaur was just the first of many fuzzy and feathered theropods to be uncovered. Another, called Caudipteryx, had feathers identical to living birds on its tail and hands, but lacked wings. With the discovery of these spectacular feathered finds, there was no longer any doubt that birds were related to theropods. But while feathered dinosaurs settled one question, they raised a new one. These animals could not fly. Why were they feathered? It was long assumed that feathers evolved for flight. But what we found was that clearly feathers predate flight and arose for some other purpose. So why did the first feathers evolve? That's hard to tell from just the fossil evidence. But living birds may offer answers. Feathers provide insulation, so the first feathers might have helped keep dinosaurs warm. and triggered a global mass extinction. Only a small group of toothless birds survived. They evolved into the 10,000 species of birds we see today. We once might have said that the dinosaurs all died out. But now we know that living birds are a lineage of theropod dinosaurs in the same way that we are a lineage of primates. Have dinosaurs gone extinct? Absolutely not. We separate dinosaurs into two groups now: the non-avian dinosaurs fortunately have gone extinct, and the avian dinosaurs are still alive, making it a beautiful world. (narrator) Dinosaurs are still with us. We just call them birds. The discovery of Archaeopteryx in a quarry in Germany in the early 1860s provided the first clue that birds descended from reptiles. In the last 40 years, scientists have identified many shared features between birds and two-legged carnivorous dinosaurs called theropods.